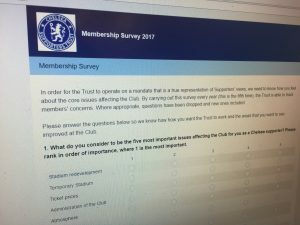 The Chelsea Supporters’ Trust has run an annual survey of its membership each year for the last four years. It provides a crucial benchmark and snapshot of what Chelsea Supporters think about the club they support on key issues such as the running of the Club; Ticket prices and access; Kick-Off times; Loyalty Points; the Stadium Redevelopment and Temporary move; Atmosphere and performance on the pitch. The results of this survey are presented by the Chelsea Supporters’ Trust board in a meeting with members of the Chelsea FC board with a view to influencing how the club deal with the issues that matter to supporters most. 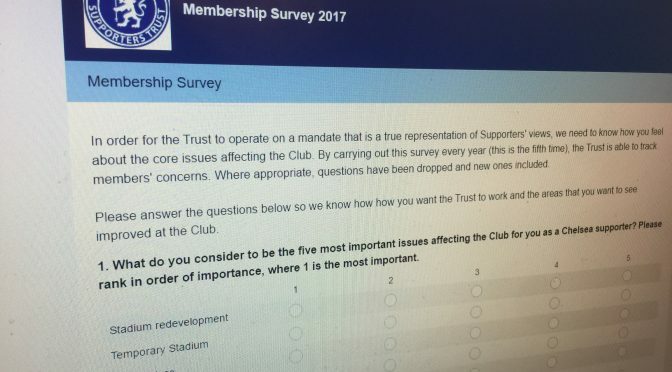 In addition, the survey results provide a mandate to the Trust that is a true representation of supporters’ views by enabling us to know how you feel about the core issues affecting the Club and to track your concerns. It is arguably the most important thing that the Trust does each year to ‘make your voice heard’. For the first time we are opening the survey out to all Chelsea supporters in the UK and Overseas in order to canvass as diverse an array of opinions and views as possible. Please click on the link below and answer the questions in the survey so we know how you want the Trust to work and the areas that you want to see improved at the Club. The survey takes approximately 20 minutes to complete and will run until 30th June.